CivCom meets Deputy Minister of Internal Affairs Eka Zguladze: A unique reform-working mode. On May 22nd 2015, the EU Committee for Civilian Aspects of Crisis Management had a last agenda point to cover before leaving Ukraine. The delegation met with Deputy Minister of Internal Affairs Eka Zguladze to discuss the ongoing reforms primarily related to the Police and the relationship between the Ministry and the European Advisory Mission to Ukraine. It took some time to get the cooperation at cruising speed, working on priorities, realistic achievements and needed support. The reform of the Police is of huge public interest. It is now addressed in an unconventional way, through working groups some of whom are led by internationals, but all including Ministry staff and representatives of civil society. The separation of the political power from the operational level is one of the main aspects, putting the Ministry in the role of policy maker. Verkhovna Rada approved the law on the police reform on Thursday 21 May in the first reading. The Ministry intends to deliver quick visible change and messages. The government and the law enforcement agencies will change for the benefit of citizens. “There is no way back. The change is going to happen. We have to accept it and work on it”, said the Deputy Minister. 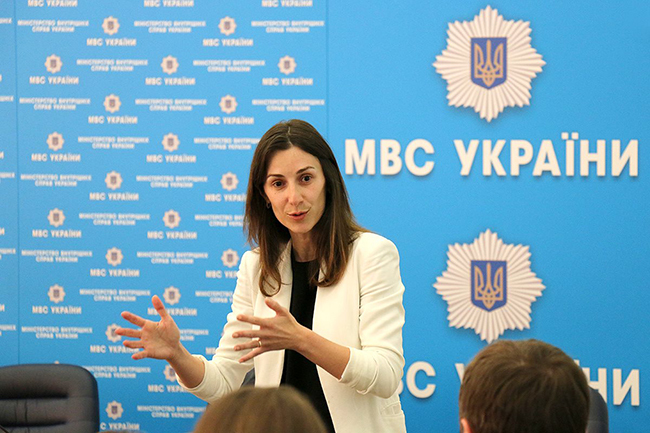 Mrs. Zguladze explained the new Kyiv Police project to be rolled out in Odessa, Lviv, Kharkiv and Dnipropetrovsk in a second phase. The interest is huge: 37.000 candidates, of which 40% female have applied. 70% of them have a high qualification and over a third quit another professional career to take up the new challenge. Selection procedures are conducted partly electronically and comprise psychological, physical and medical tests. The process is completed by a structured recruitment interview. The police training is now performed in an interactive way and introduces new standards for tactics, use of force and communication. The European Advisory Mission is involved in the process according to its mandate. EUAM advises the Ministry on development of secondary legislation and normative acts, standards of operation, general standards and vetting. The reform addresses not only the patrol police, but also neighbourhood policing, special units and criminal police. Deputy Minister Zguladze underlined the importance of coordination, to which the EUAM agree strongly.